Inspirational Music That Will Change Your Life..One Song At A Time. 15. Are You Calling Me Lord? Welcome!! Thank you so much for choosing to visit our site here on CD Baby! 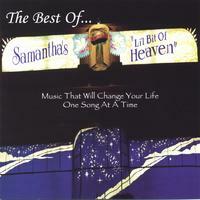 Samantha's "Li'l Bit of Heaven", founded in 1994, began with a dream I had that the world could be a better place. It was my vision that people of all ages and backgrounds could celebrate their differences instead of being divided by them, and is a reality that came to pass through prayer, faith, and God from whom ALL THINGS are possible! It was my heart's calling to touch lives through the power of Christian music. Since then, over 60,000 guests and musicians have visited this "Heavenly Oasis" from all over the world! Broken hearts have been mended, hope restored, faith lifted, and lives transformed through the healing power of "Music with a Message". Testimonies from the guests that have visited here have all shared how this music has enriched their lives. It has always been my desire to create a CD so that everyone would be able to take a "Li'l Bit of Heaven" home with them. I also thought about the healing it would bring to those that were ill or hospitalized . Or you might be someone who may never have the chance to visit us in person. It is with great joy, that I can now present to you our first collection of some of "Li'l Bit of Heaven's" greatest music Volume # 1. The styles on this CD are so vast! From Contemporary Christian to Swing, R & B to Pop, Country Western to Gospel, upbeat and ballads, you can't help but be inspired! Please keep in mind that there are just too many wonderful singers, bands, and musicians featured here at "Heaven" to fit on just one CD, so watch for many more volumes to come in the future. Through this music you may experience tears of healing, or feet that can't stop dancing. In fact, don't be surprised if you find yourself feeling overwhelmed by just how much you are loved. I pray that those of you who treat yourself, a loved one, or a friend to this CD will be blessed and that the music will fill you with joy, faith, hope, and most of all God's LOVE. May this music change your life as it has mine....one song at a time. The more I listen, I can't decide which song I like best. Ilove them all. Now I can have a little bit of heaven everywhere I go all day all night long. I can't wait for the next cd vol.2. A great mix of wonderful, heavenly music. The next best thing to being in heaven. Want to hear truly alternative, subversive music? Then check out the message within the tracks of this CD. It may just change your life. Go ahead. I dare you. I can't stop listening to this CD. It's uplifting and inspirational without being preachy. It features Long Island artists of all genres of music. Great to listen to at home, in the car or at the office. What great joy to review this CD with all the different artists represented through the years on the stage at Samantha\'s Li\'l Bit of Heaven. The way to go! Superb. Wow! What a great compilation from start to finish. I wonder if people know the amazing talent there is on Long Island!!! Each song is filled with powerful lyrics and great music. You need to have this CD in your collection.